Also known as the white scavenger vulture or pharaoh's chicken, the Egyptian Vulture (Neophron percnopterus) is the smallest of the European vultures. It is a bird of prey with essentially white and black plumage, yellow facial skin, and long, wedge-shaped tail. Immatures have totally brown plumage, and also bear a wedge-shaped tail. 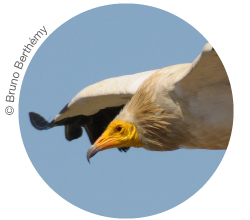 The Egyptian Vulture is a summer migrant that can usually be spotted In Portugal and Spain from late February, remaining in nesting areas from March to September. In autumn it migrates south to sub-Saharan Africa where it overwinters. The birds prefer rugged terrains, usually located in river valleys and mountains. They nest in holes and rock platforms. The Bonelli’s Eagle (Aquila fasciata) owes its name to the Italian ornithologist and collector Franco Andrea Bonelli. It preys on other birds, from pigeons to partridges, which it takes in flight. This is a large-sized eagle, identified by its white belly and underparts, dark wings, and a white spot on the back (only seen in adults). Juveniles have deep buff underparts and underwing coverts. 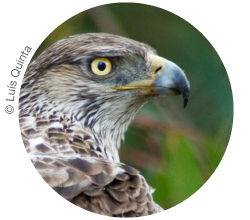 This eagle is resident in the Iberian Peninsula. It is a rare and localized species that is found in steep valleys and rugged forested areas. It can nest on cliffs or on large trees. The Red Kite (Milvus milvus) is a medium-sized, rufous bird of prey with two white areas (“windows”) in the underwing coverts, and a markedly forked tail. It is an excellent soarer often seen flying in circles in thermals, in a calm, slow flight. It is found in open fields and oak groves, usually associated with cattle, although it nests in trees. 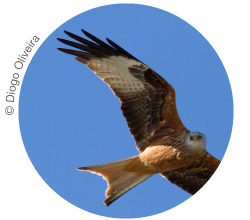 There are two Red Kite populations in Iberia: one fast declining population found in the north and centre of the Peninsula, composed of nesting residents; and a much larger population, composed of migrants from northern Europe that winter in the Iberian Peninsula. SPEA has already conducted surveys on the latter population, with support from several entities and volunteers. 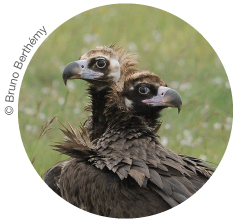 The Black Vulture (Aegypius monachus) is Europe’s largest soaring bird. Its distinctive characteristics include size, wide wings whose wingspan can reach 3 m, short tail, and dark, almost black, plumage. It is an uncommon bird in Iberia, where it occurs only in remote hilly or flat areas, with extensive cattle raising, mostly in the southwest of the peninsula. The Black Vulture is resident but travels long distances in search of food, particularly outside the breeding season. It nests on the top of trees.